Urban Pipe Outriggers let you merchandise the perimeter of your store while maintaining the theme of the other Pipe Clothing Racks in the center of your retail area. With their sturdy construction and anthracite grey finish, Pipe Outriggers are perfect for any retail setting. When merchandising using Pipe Outriggers use the many accessories are available. Pipe Outriggers allow you to divide your store into sections, each framed by two Pipe Outrigger uprights. 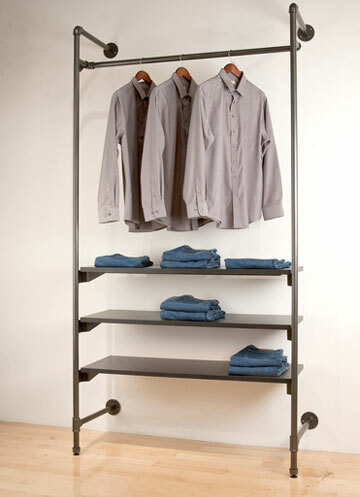 View the entire Pipe Rack Collection here: Pipe Clothing Racks. Extension Kit for Freestanding Pipe Islander - 24"
Extension Kit for Freestanding Pipe Islander - 48"